A senior BP executive has told a US court that the oil giant was not solely responsible for the 2010 Gulf of Mexico oil spill. Rig operator Transocean and contractor Halliburton must also bear portions of the blame for the explosion and resulting spill, Lamar McKay said. The trial, in New Orleans, will determine liability for the spill. BP could face a huge fine, despite agreeing in 2012 to pay $4.5bn (£2.9bn) to settle criminal charges. An unfavourable trial verdict could see the firm liable for the biggest civil fine in history, of up to $17.6bn. It has also paid $7.8bn in a settlement with people and businesses affected. In the first testimony from a high-ranking BP executive, Mr McKay stressed that all those involved in the Deepwater Horizon disaster should take some of the blame. While BP was extracting the oil from underneath the Gulf of Mexico when the Macondo well exploded, the Deepwater Horizon rig itself was owned by Transocean. Cement used to seal the well was provided by Halliburton. 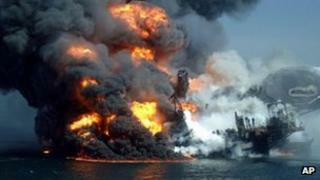 The Macondo explosion killed 11 men and released an estimated four million barrels of oil into the Gulf over 84 days. Since the leak was plugged, the debate over who was responsible has raged on. "I think that's a shared responsibility, to manage the safety and the risk,'' Mr McKay told the court. He said the explosion was a "tragic accident" resulting from a "risk that was identified". An expert witness testifying on behalf of the plaintiffs - the US Department of Justice and the US states affected by the spill - countered that the disaster was a direct result of poor management and heavy cost-cutting at BP. "It's a classic failure of management and leadership in BP," said Robert Bea, an engineering professor at the University of California, Berkeley, who previously worked as a safety expert for BP. He described BP as "too lean" following rounds of cost-cutting that led up to the disaster. On the first day of the trial, a lawyer for the justice department said the disaster resulted from BP's "culture of corporate recklessness". "Despite BP's attempts to shift the blame to other parties," Mike Underhill said, "by far the primary fault for this disaster belongs to BP". One of the lawyers for the plaintiffs, Jim Roy, said BP had put "production over protection, profits over safety". Mr Roy also attacked the rig's operator, Transocean, saying the company's safety official on the rig had received little training: "His training consisted of a three-day course. Amazingly, he had never been aboard the Deepwater Horizon." He did not spare contractor Halliburton, either, saying it deserved some of the blame for providing BP with cementing of the Macondo well that was "poorly designed, not properly tested and was unstable". The trial will determine the causes of the spill, and assign responsibility to the parties involved, including BP, Halliburton, Transocean, and Cameron, which manufactured the blowout preventer meant to stop oil leaks. Later, it will determine how much oil actually leaked, which will lead to the calculation of how much the oil companies owe in civil fines. It is expected to be one of the biggest and costliest trials in decades. BP chief executive Bob Dudley has said he firmly believes the company was not grossly negligent. The trial could last for months, but the risks are so great for BP that it may try to reach a settlement, analysts suggest. Robert Percival, an environmental law professor at the University of Maryland, said: "The risk for both sides is so great - for BP it's their name, reputation and future contracts with the US government. For the US government it's all the resources they're spending on the trial - particularly if BP is not found grossly negligent." The second part of the trial, set to begin in early autumn, will attempt to determine how much oil was leaked, which would then determine the size of the federal fine. The Department of Justice intends to demonstrate BP was grossly negligent, which puts the maximum penalty at about $17.6bn. However, on top of that, the Gulf states of Louisiana, Alabama, Mississippi and Florida are demanding an additional $34bn in damages under the Oil Pollution Act, citing uncertainty over the long-term effects of the spill on their coastline as well as economic losses and property damage. But BP has said it will "defend vigorously" against the claims, saying the methodologies used to calculate them were "seriously flawed". Once the world's second-biggest oil company, BP has fallen to fourth place among the "oil majors" after selling off billions of dollars worth of assets to set aside money to cover liabilities related to the disaster.